What does each weight plate weigh in standard gym equipment? How much weight am I actually lifting when I set the pulley to lift different numbers of weight plates? Will these answers be consistent across all weight lifting equipment, or does it change from manufacturer to manufacturer? I have searched online and found lots of pictures of equipment, and lots of equipment for sale, but haven't been able to find anything at all on the weight bars and their specifications, let alone anything definitive. For what it's worth, I primarily use free weights rather than isolation machines. I simply had some upper body muscle soreness the other day and could not trust myself to use anything but lower-body machines that day. I have only a couple of months of consistent gym use under my belt. Last, you might ask why I want to know? Because I am entering my exercises in a spreadsheet and charting them. I have lost 8 pounds already, without really dieting (besides working to avoid soda and frivolous sweets). Seeing my strength and workouts improve on the chart is motivating. I'd like to enter reasonable values when I do end up using some of the machines. The [below] chart shows the actual weight you are lifting when the ratios are applied. To find the actual weight you are lifting you would come down from the ratio being used and across from the number of the weight plate you have pinned. 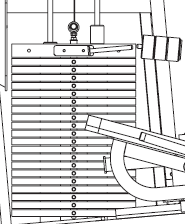 The top plate weighs just under 41 pounds, and all the other plates weigh 20 pounds, but you have to add 15% due to the mechanical disadvantage inherent in the machine. So effectively, the top plate is 47 pounds and all the others are 23 pounds. From my experience, most add on plates tend to be quarter steps to the next. For example: Plate 1 (~47lbs) and Plate 2 (~70 lbs) are 23 lbs apart. This means that Add On 1 should take you to roughly 53 lbs, Add On 2 should take you to roughly 59 lbs, Add On 3 should take you to roughly 64 lbs, and then you move up to the next plate (Plate 2 at 70lbs). This of course is based on no solid facts, just deductive reasoning based on prior experiences. I am sorry to see that you have to use that poor excuse of a machine, because no proper machine manufacturer labels their weights in this way. 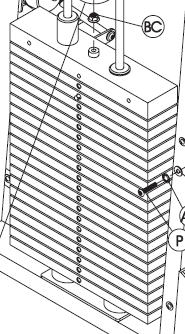 However, I have found on the page below that the whole stack on your machine is 455 pounds. Dividing this by 15 plates, you get about 30 pounds per plate. Usually the small weights you can add at the top are around half of what each plate would be. As for third question, weights vary manufacturer to manufacturer, even machine to machine. For example, if it's a leg related machine the plates will usually be 20-40 pounds each (since legs can handle a lot more weight). Machines that you would use for arms usually go up in 10-15 pounds gradations. Some time in the last few months, Hoist standardized its online information about the calculated weight lifted on their various machines, based on the effective weight's varying by the lifter's body weight. 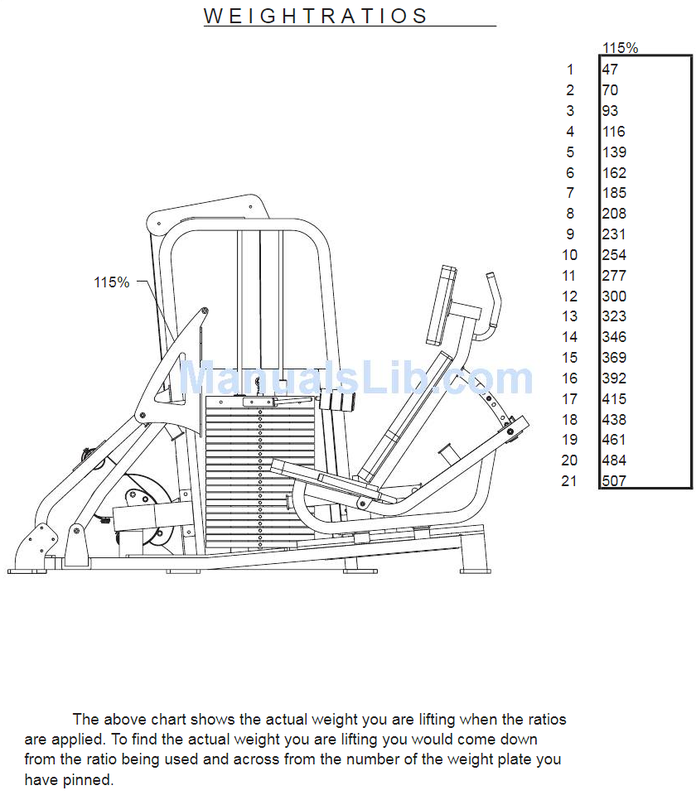 A search for "Hoist leg press [or whatever] free weight equivalent" should take you to their calculators. If you see a reference decal on their equipment, it assumes body weight of 150 pounds, which is also the default start point for the calculators. 380lbs is the answer you're looking for. I was able to find a site that had the correct numbers but of course I lost the website. But I was able to print out a copy for my facility. Not the answer you're looking for? Browse other questions tagged exercise-equipment weights or ask your own question. What is the effective weight when doing push-ups? What interesting simulations/games exist with open APIs for integrating with exercise equipment? At what frequency should I increase weight? What is the advantage of using Olympic plates over standard ones? How often does running or weight lifting cause capillary bursts? I keep having to lower my weights by a couple Pounds on each set. What am I doing wrong? What are default weight ratios for different Crossfit exercises? Max. Weight vs. Volume - what to orient on?